The hurdles that obstructed the relationship in the past are no longer influential. At the invitation of the speaker of the U.S. House of Representative, Paul Ryan, Indian Prime Minister Narendra Modi addressed a joint session of the U.S. Congress on June 8. In his speech, Modi reminded us that former Indian Prime Minister Atal Bihari Vajpayee had termed India and the United States “natural allies” a decade and a half ago, in 2000. And it is in that spirit of being “natural allies,” Modi stated, that the U.S.-India relationship is sailing into new welcoming waters, with the hurdles of the past left behind. Modi was referring to the fact that India-U.S. relationship had not always been easy, as India was viewed by Washington as tilting toward the Soviet Union during the Cold War. At the same time, the close U.S. relationship with Pakistan was viewed by India as detrimental to Indian interests. Many in the United States could not see much potential in an India that was poor and under-developed in 1947. India’s stance of non-alignment and strategic autonomy created further hurdles, as most policymakers in the United States could not understand what was meant by being non-aligned or what the term “strategic autonomy” really amounted to. India, on the other hand, was suspicious of American intentions, and wary of overt American influence in India’s internal affairs and foreign policy. Given the power differential between the United States and India, India was apprehensive that lurking in an “interdependence” rhetoric was an aspect of American dominance, in which U.S. interests in the world would overshadow India’s own interest and foreign policy choices. Fast forward to the present, and there are several reasons why that past should no longer influence the decisions of today. First of all, the confining structures of the Cold War are dismantled. Ideological differences, therefore, no longer dictate foreign policy choices as much as they did during that period. Second, a closer U.S.-India relationship is beneficial for the world, as both political systems are based on democratic representation and animated by liberty, equality, and freedom of expression. Third, the new security challenges, like defending the freedom of Sea Lanes of Communications (SLOCs), especially given China’s growing assertiveness with regard to its maritime space, have provided the much needed urgency for both the United States and India to deepen their security relationship. While Washington is visibly concerned about growing Chinese assertiveness in the South China Sea, India is equally anxious with Chinese territorial aggression in its land borders. China claims about 120,000 square kilometers of claimed Indian territory as its own. Fourth, the issue of terrorism is a common concern shared by the United States and India. Both countries have been affected deeply by terrorist attacks; in India’s case, some of the attacks were engineered by the terrorist group Lashkar-e-Taiba (LeT) from Karachi, Pakistan, while Osama bin-Laden, the leader of al-Qaeda was discovered by the United States living in Abbottabad, a Pakistani military town. In his speech to Congress, Modi reiterated the significance of security cooperation between the U.S and India to fight terrorism, especially to deter the goals of groups like ISIS to spread their extremist ideology. From the U.S. perspective, to have India as a trusted partner and ally is advantageous to its overall grand strategy. First, India with a population of 1.2 billion, living within a democratic set up, is politically structured to resonate with American values of democracy, individual liberty, and freedom. Henceforth, if America hopes to see a world with democratic values spreading, having India as a partner is definitely a force multiplier. Second, India is fast emerging as an economic powerhouse and a military power. By 2030, India is projected to be the third largest economy in the world, with a projected GDP of $10 trillion, behind the United States’ GDP ($33 trillion) and China’s GDP ($34 trillion). India will become the largest economy in the Commonwealth, overtaking Britain. Hence, a deeper U.S.-India relationship will bolster trade, create jobs, and further enhance economic investments and growth in both countries. Third, the United States needs to share the burdens of regulating the “global commons” based on international norms and rules. This is especially critical in the Asia-Pacific region. Who could provide a better partnership in this aspect but India, with a growing military capability and fast-emerging naval power? India’s defense budget for the year 2015-2016 was $40 billion, ranking it amongst the top militaries in the world. Significantly, the U.S-India military relationship is on the upswing. George Holding, a Republican from North Carolina, introduced the U.S.-Defense Technology and Partnership Act legislation in the House of Representatives, which elevates India to the same level as Washington’s NATO allies as well as treaty partners for defense sales notifications. In 2015, the Department of Defense (DoD) established the India Rapid Reaction Cell (IRRC) geared toward removing obstacles for technology sharing with India. Military exercises between the United States and India have increased exponentially over the last few years, aimed at creating interoperability between the two militaries, especially in the advent of responding to conflicts in the Asia-Pacific, piracy, and humanitarian disaster relief. There are talks for joint U.S.-India naval patrols in the Indian Ocean as well as the disputed South China Sea. In January 2015, during President Barack Obama’s visit to India, both countries signed a strategic vision statement for the Asia-Pacific and the Indian Ocean in which freedom of Sea Lanes of Communications (SLOCs), including in the South China Sea was identified as of priority. Fourth, India is fast becoming a champion of renewables as its economy becomes more and more energy dependent. It is heavily investing in building its solar infrastructure. The aim is to support the Paris climate agreement and work toward a limited carbon footprint and a cleaner earth. It has also enacted a National Offshore Wind Energy policy, while at the same time aiming to achieve renewable energy goals by 2022. 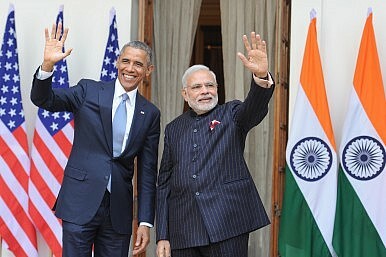 Both Modi and Obama pledged to ratify the Paris agreement by the end of this year, an urgent need that has risen to ensure that the treaty enters force quickly, given that the Republican presumptive presidential candidate for president, Donald Trump, has threatened to renegotiate the Treaty if he becomes president next year. If India ratifies the treaty, this will ensure that the requirement of ratification by at least 55 parties of the UN Framework Convention on Climate Change (UNFCCC) with 55 percent of global emissions, mandatory for the treaty to enter force, is met. Nuclear energy for renewables has also been bolstered by an agreement between the United States and India that facilitates Westinghouse to build six commercial nuclear reactors in India by June 2017. This boosts profits for Westinghouse, while at the same time, bringing about closer nuclear energy cooperation, put in place by the 2005 Indo-U.S. nuclear deal signed by former Prime Minister Manmohan Singh and former President George W. Bush. Fifth, India’s experience in handling enormous population diversity, including being home to the second largest Muslim population in the world (177 million), and slotted to be the largest in the world by 2050 (311 million), may offer some vital lessons to the United States given its growing diverse populations. Despite some challenges, India has remained united, and its diversity has become its strength today. This celebration of diversity is reflected in its myriad languages, cultures, traditions, that have learnt to co-exist. Ironically, Obama, in a speech to the Indian public last year cautioned against growing religious intolerance and requested Indians to celebrate their diversity and protect it zealously. This year’s U.S. presidential primaries, especially on the Republican side, have shown how the Republican nominee Donald Trump has dangerously played the diversity card, targeting minorities and immigrants for political gains, thereby encouraging a culture of intolerance and racial hatred. India does offer cautionary tales of what could happen if such intolerance is encouraged as well as inspiring stories of great harmony when diversity is embraced and celebrated. Finally, in surveys of social attitudes across the world., India comes out as a country with some of the most favorable social attitudes toward the United States. People-to-people contact is on the rise, as well as academic and cultural exchanges. The Indian American diaspora of three million has also proved an asset in supporting better relationship between the two countries. Therefore, for the United States, having India as an ally and trusted partner in the world is a good thing. It means it has, literally speaking, 1.2 billion friends that would come to its aid in times of need. It means Washington could rely on India’s diplomatic and military support in case there is conflict escalation in the Asia Pacific. Most importantly, the United States can count on Indian Muslims to challenge and question the barbaric ideologies perpetrated by groups like ISIS to spread terror in the world. The United States could also count on Indian support to tackle challenges of climate change. Most importantly, it could count on India to support and strengthen a rules based international order that sustains peace and prosperity in the world. Dr. Namrata Goswami is a MINERVA Grantee of the Minerva Initiative awarded by the Office of the Secretary of Defense. She is also a Senior Analyst for Wikistrat. She was formerly Research Fellow at the Institute for Defence Studies and Analyses, New Delhi and a Senior Fellow at the United States Institute of Peace (USIP), Washington, D.C. Dr. Goswami is a recipient of the Fulbright-Nehru Senior Fellowship, 2012-2103. The views expressed here are solely that of the author. Key priorities for the Trump administration as it engages with India.